Whether you don’t have access to the exact brand you want, you’re trying to save some $$$ on painting your tips, or the makeup store within a realistic mileage from you doesn’t offer luxe lacquer, there are plenty of highly understood reasons to go on wild beauty dupe search, especially when it comes to nail polish. The reasons are simple, but actually engaging in this process of comparing and contrasting? Well, who has time to figure out if that much cheaper bottle of polish isn’t just a lookalike in disguise? Luckily, your iPhone—and those behind the beauty app SuperDuper—do. 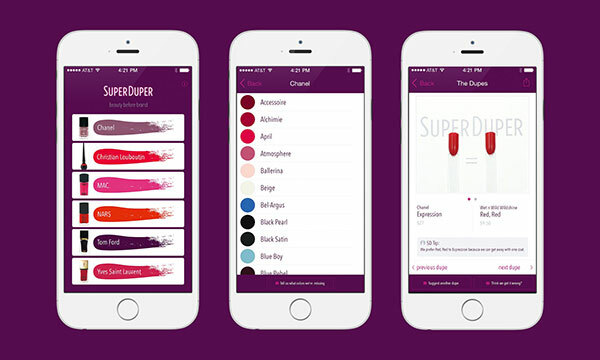 SuperDuper, created by Internet entrepreneur Lizzy Klein, is an iOS-exclusive app that finds the user much more affordable dupes for popular and sought-after luxury brand nail polish colors. Basically, this app gives you a similar (almost identical) nail polish formula that is often much cheaper and more accessible than, perhaps, those designer brands. Klein also tells us that it gives you an opportunity to get the same hot color you may have read in a magazine when you’re sitting at the salon and they don’t have, say, Tom Ford in stock. Klein tells us the idea was born when she was in Sephora with her sister, looking for a shadow product like a very specific brown MAC eyeshadow. They knew a dupe had to be in a store like Sephora (it’s a beauty haven, after all) but didn’t have the product in their hands to compare. “We didn’t have it in our hands. How do you dupe it when you don’t have it?” says Klein. And with that, Klein had a “there should be an app for that” moment. From there, the idea of building an app—starting with always-trending, consumer-friendly nail polish—to help you find dupes on demand was born. 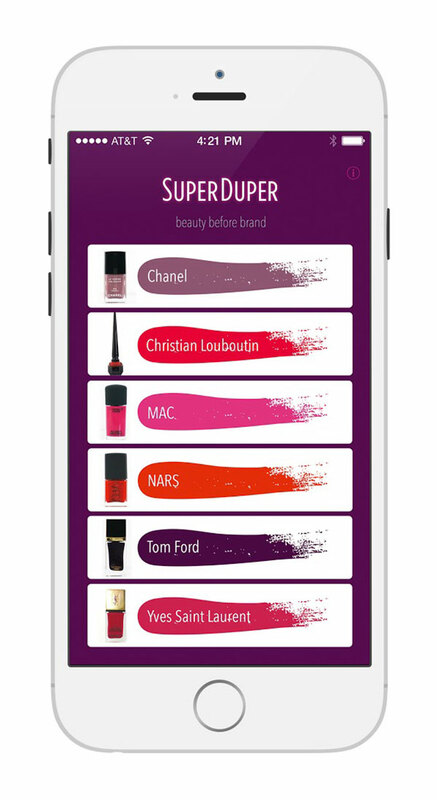 When you open the app, you’ll find six different nail polish brands, including Chanel, Christian Louboutin, MAC, NARS, Tom Ford, and YSL. When you click on each individual brand, you’ll be directed to a screen that shows you the brand colors they have dupes for. These numbers vary based on the brand. For example, SuperDuper has dupes for 27 of Chanel’s colors while they have 17 for Christian Louboutin polish. Once you pick a color, you’ll be directed to a product dupe, along with a price comparison of both. They try to keep every dupe under $10. As of now, the app is working to add more brands, like Marc Jacobs and Dior, to its roster but won’t add any new offerings until they get about 10 or 11 dupes. The most popular dupe, from what Klein says is a brand perspective, is Chanel, but it can be pretty mixed. The testing process is pretty unique—and while they do take suggestions on Facebook, Twitter, and email—it involves a lot of nail painting to ensure they have a good fit. “We test them in florescent, artificial light and daylight,” explains Klein who also says they have more then one person sign off on the dupe. “It’s amazing how different they are in light,” explains Klein of how polish looks when it’s actually out of the bottle. They paint alternating nails (the dupe, the designer, the dupe, etc) to make sure they’ve got a fit. From there, they upload the dupe but always watch it to make sure the color doesn’t change. “For every dupe that’s on there, there are 15 colors that are really close that we rejected,” says Klein. As they move to the future, there are hopes of taking the app outside of just the iOS operating field (making it usable for android applications), making it a shoppable app with a web component, and growing the types of product dupes available. “The bigger vision is to really do an encyclopedia of color cosmetics that make it easy to compare and contrast,” she says. The most requested next item? Lipstick. Testing for this type of product will obvious change a bit, as Klein says it has many variables. And those 15 similar but rejected shades? She says they’d want to create some sort of system to show you other products that are very close but maybe not an identical fit, in case you were looking for something a tad light or darker. Who can argue with more product suggestions? Have you used SuperDuper? What types of products would you like to see them dupe?